Today is the last day of 2010, so I was looking for a clock image to post. 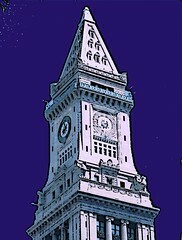 I searched my photos and found a picture that I took back in May of the big clock tower in Boston (Custom House Tower). I was hoping to find a night time shot, but the original image was taken in the afternoon. But art can sometimes triumph over time, so I opened the image in Painter to see what I could do. I cropped the image to focus attention on the clock. Then I used some digital pastel to move the hands of the clock. I used the magic wand tool and the paint bucket tool to change the sky from sky blue to dark purple. Then I added a pink overlay. After that, I posterized the image, and then made a digital woodcut from that. I did one final crop and here is my image, which I will use to wish my friends and family safe and happy celebrations tonight, and all the best in 2011. Tonight I used my Painter program to create this digital woodcut, using a photograph that I took on December 22, before the recent snowstorm. 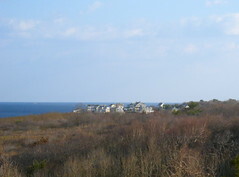 This is a view of the Bass River, here in Beverly, MA., taken from the little path behind Starbucks. I used Painter's surface effects to make this digital woodcut from the photo that I took after the recent blizzard (posted here on December 27.) I fiddled with the controls until I had the amount of black line and heaviness that I wanted. 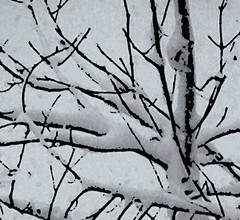 I used my Painter program to create this posterized version of the photo that I posted here yesterday, a picture of snow on a branch that I took after the recent blizzard. I also created a digital woodcut, which I plan to post here tomorrow. Although I went out this morning to shovel snow, I was too bundled up against the wind to attempt photography, so my camera stayed in my pocket. But afterward, I took some pictures through the windows of my nice warm house. Tonight I cropped this image of snow on a branch from one of the photographs that I took this morning. The soft focus (from the close-in crop and the view through a window) made me wonder how this image would look posterized or as a digital woodcut. So I used Painter to find out, and plan to publish the results here tomorrow. To be continued. . . . The weather forecast that predicted snow beginning at noon was revised to snow starting around 6 PM, so plans were revised to fit in a movie. By the time the movie was over, it was already snowing. (This is a little nothing compared to the snowstorm that is happening right now, but still, it was pretty.) I was in the passenger seat for the ride home, so I took out my iPhone and took lots of pictures, almost all of them while the car was moving. Tonight I cropped this composition out of one of the best photos. I used Painter to posterize some areas of the photo, using the "magic wand" tool. I also used some digital pastel and cut and paste to obscure a pole that was leaning so badly that it created a distraction. But I left the wires in the photo because I like the way they look. 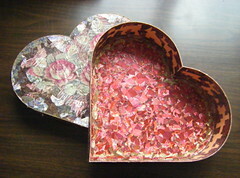 This is my collage and decoupage project, a heart-shaped box that I am covering with pieces of printed metallic ribbons in various patterns. I have been working on it, and this is how it looks at now. In this photo, you can see that the progress working on the inside wall of the box. The original orange pasteboard still shows through the predominantly pink pattern that I am using, but I am beginning to get an idea of how it will look when I am done. 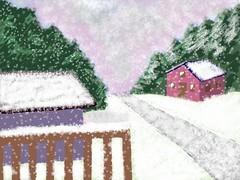 Yesterday I posted a digital sketch of a snow scene that I drew on the iPad with the Brushes app. I started with the idea of creating an animation of snow falling because I knew Brushes would capture a stroke-by-stroke video as I drew. I had to plan not only what to draw but when to draw it. I had a lot of fun "making it snow"! I hope it is fun to watch as well. Yesterday I drew this digital sketch on my iPad using the Brushes app. I was thinking about drawing a snow scene. Because Brushes captures as stroke-by-stroke video as you draw, I wondered whether or not I could make it snow. I think it was a success. I plan to post the video tomorrow so you can see it snow. For now, here is the little drawing that was the end result. I plan to use it as a way to wish everyone the pleasures of the season. This image began with a picture that I took yesterday. It was late afternoon and I was heading into the house. The December afternoon sunlight was hitting the trees just right, and I liked the contrast with the snow-covered roof. I didn't have my digital camera (wasn't really thinking about taking a picture), but fumbled around with my gloves and my iPhone and took a couple of photographs. When I got the image into the computer, I could see that the focus was too soft, but I decided to see what I could do with it. I cropped the image in iPhoto. 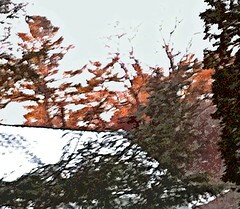 Then I opened the image in Painter and adjusted the contrast and the focus. Next I added a color overlay to the sky, which was washed out in the photo. After that I did some selective posterizing, using the magic wand tool. Finally, I cropped again in Painter to get the composition that you see here. 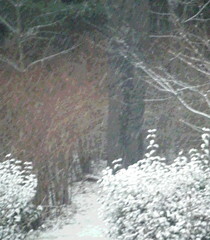 I cropped this image out of one of the photographs I took yesterday, when we had the first snowfall of the season. I opened the image in Painter and posterized it. Then I cropped twice more to get the composition that I wanted, and here it is. It finally snowed here today, the first snow of the year in the Boston area, and I am excited. Now I know there are lots of reasons to dislike snow. It can be very inconvenient, I agree. 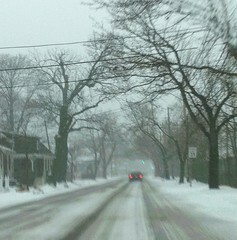 I don't like driving in snow, and just today, I almost got stuck trying to drive uphill on a slick road. But I love the way the snow looks, and more important, I love the fact that snow makes me see the world differently because it makes me pay attention and really look. 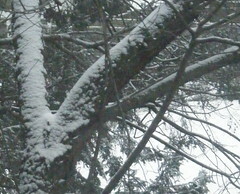 So after I had safely returned from my adventures on the road, I took some pictures of the first snowfall. Here is one of them. Tonight I cropped this image out of one of the photos that I took recently at the pond at the Cummings Center (Shoe Pond). I wanted to focus on the details that first caught my eye when I pulled out my camera: the reflected winter light and the texture of the branches against the texture of the icy surface. Tonight I also used Painter to posterize the image. 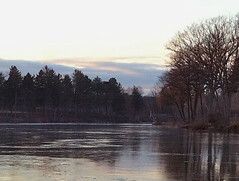 This image began during a late afternoon walk at the Cummings Center Pond, here in Beverly, MA. 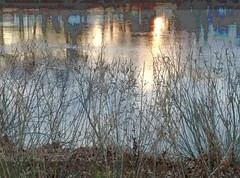 I liked the December light on the icy pond, so I took some pictures with my iPhone. Tonight I edited some of the pictures. This image is something I cropped from the background of one of the photos because I liked the composition and the reflections in the water. This is a collage and decoupage project in progress. 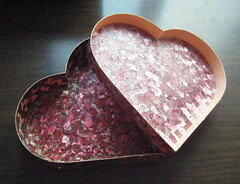 I took a break to work on this heart-shaped box this afternoon. I am using printed metallic ribbons to create patterns on every surface. Today I continued to work on the interior wall, which I am covering with a pattern in pinks, green, and blue. This view also shows the inside of the box top. This is a drawing exercise in pen and ink that I did tonight with a Sharpie and a sketch pad. I wanted to get more practice with creating texture, so I started working on a landscape. This is drawing from imagination, but I was also trying to capture the some of the scenes that I see as I drive along some back rounds here on Boston's North Shore. This is a stroke-by-stroke video of a digital sketch that I drew on the iPad yesterday with the Brushes app. (Brushes captures a record of your strokes as you draw.) For some reason, the little video stopped a bit short, so I used iMovie to add a still photo of the sketch to the end of the video. I think I may have set the video for wide screen, which might be why the format is a little different. Anyway, I think it's fun to watch. Just press play. Today I took my car in to be repaired, which meant I would have at least an hour to kill at Starbucks while I waited, so I took my iPad with me. 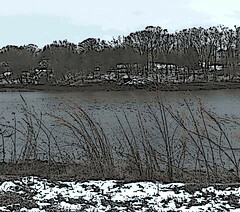 What I had in mind was the muted color palette of December that I had just seen as I was driving to the car repair. As winter approaches, when it is overcast and cold enough to snow--but doesn't--there are lots of greys and neutrals in the landscape, colors that I have learned to appreciate more over time. I was also interested in some more practice using the different kinds of digital brushes in this application, so I started this landscape, working from my imagination. After about an hour, I caught a ride home because I had to leave my car in the shop all day. But I still hadn't finished this sketch, so I worked on it for a few minutes when I got home, and here it is. The Brushes app on the iPad also captures a "stroke-by-stroke" video as you draw, so I plan to post that here tomorrow. 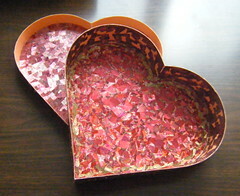 This morning I took advantage of an early start to work for a while on this project: a heart-shaped box that I am covering with collage and decoupage designs cut from printed metallic ribbons. At this point, I am working on the inside wall of the box. I am using a predominantly pink pattern, with some green and blue mixed in. I have been worried about having enough of this pattern, but today I found another piece of ribbon with this pattern. 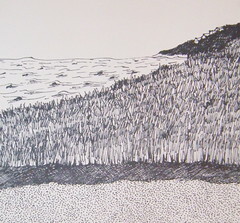 Tonight I drew this pen and ink sketch, loosely inspired by the image I posted here yesterday, a photo that I took recently at Halibut Point, up near Rockport, MA. I was thinking about that photograph, but I wasn't looking at it. This is a drawing from memory, rather than observation. It is interesting to see what is the same and what is different, what I remembered of the photo and what I remembered from seeing the landscape. I used a Sharpie to draw in a sketchbook, and was just getting some drawing practice. 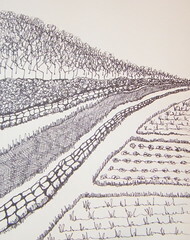 I concentrated on creating texture with pen and ink. Some of these are textures that I learned to create back in high school art class with Mr. Corty (at Pueblo Central). Practicing these textures with pen and ink was tedious for a teenager, especially because we had to use quill pen and real ink, too. But it was a very useful exercise, too. Tonight I cropped this image out of a photograph that I took on November 20 at Halibut Point, near Rockport, MA. I took this photo is from the scenic overlook. I enhanced the saturation just a bit because the camera muted the red tones in the grass. I think I might try to paint this scene sometime. Here is an image to match the today's gloomy skies. This is a photograph that I took back on November 5 during a trip into Boston (a South Station run.) The sky was gloomy, like today, but sometimes there's a kind of luminosity in that kind of light, if you look hard. 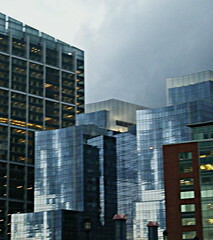 I was in the passenger seat as we left South Station for the ride home, so I got out my camera. I took advantage of a red light to snap a couple of photographs through the windshield. I liked the composition and the light in this image, but the focus was a little too soft. Today I used both iPhoto and Painter to edit this shot, adjusting both the exposure and the focus. I also put a little bit of color overlay in a small area of the sky. Well, it is still Chanukah till sundown, so here is my last Chanukah image for this year. 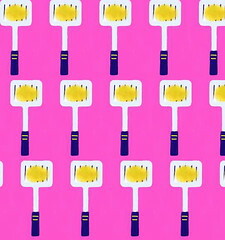 Yesterday I posted a little digital sketch of a latka on a spatula (made with the Brushes app on the iPhone). Later, I used Painter to clean it up a little and to create this pattern. Here's an image for anyone still eating leftover latkas! Anyway, I had a vague idea for an image of latkas and spatulas so this is what I drew. Brushes is great, even on the iPhone, but still hard for me to control. 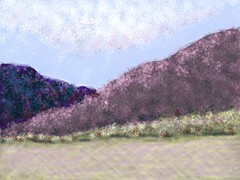 So when I got home, I opened the image in Painter and cleaned it up a little with digital pastel. Then I used it to create a pattern, which I will post tomorrow. This image is another digital "print" made with Painter's pattern pen and a menorah pattern made from one of my digital sketches. After I had the strokes of the pattern pen where I wanted them to be, I posterized the image. This process and the images that result from it remind me of printmaking, so I call them digital prints, though they aren't really prints at all. Tonight I made this image on the computer. I used Painter's pattern pen. 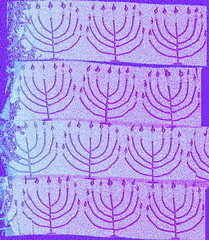 I made this pattern last year, from one of my digital sketches, called "Metallic Menorah" (posted 12/10/09). I used pink paper for the background. Once I had the "strokes" of the pattern pen where I wanted them, I posterized the image and then cropped it to get this composition. These menorahs look like they are having fun. 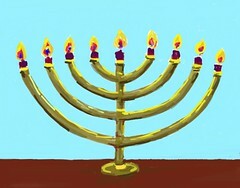 Yesterday I posted a digital drawing of a menorah that I made on my iPad with the Brushes app. Brushes also captures a "stroke-by-stroke" video as you draw. I used iMovie to combine the little Brushes video with the jpeg of the final drawing. The other day, I started a second digital sketch of a menorah on iPad (using Brushes). At the time, I was having technical difficulties with a Brushes action video of a menorah and was thinking of starting over. But I figured out how to solve the problem and was able to post the video, so I abandoned my second menorah sketch. Today I decided to go back to it and finished it up. I tried to use my new stylus. I think it will be helpful when I get used to it, but right now it is mostly frustrating, so I finished up the drawing without it. Once I transferred this image into the computer, I used iPhoto to straighten and crop, and then used Painter to do a little post-production work (mainly straightening out the base line with a grid and some digital pastel). This time I had no problems with the stroke-by-stroke video, and I plan to post it tomorrow. This morning I had another go at the spinning dreidels pattern, this time with brighter colors. 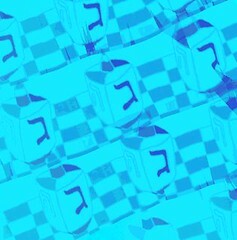 I made this image with Painter's pattern pen, loaded up with a pattern made from a digital drawing of a dreidel that I made a long time ago. For today's image, I used the pattern pen as a marker (which makes the image clearer) and then posterized it. My dreidels are getting crazier, but that's what happens when you spin. One of the first pieces of digital art I ever made was a digital drawing called "Chanukah Dreidel" (posted here several years later on Dec. 25, 2005). 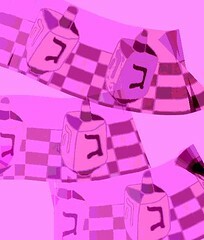 I had also captured the dreidel image in a pattern (also posted here on Dec. 5, 2007). Well, the dreidel pattern disappeared when I upgraded my Painter program, so today I found the original drawing and "captured" the pattern again. Then I used the pattern to make something new. I loaded the "digital pen" with the dreidel pattern, and started experimenting with dark blue strokes on light blue paper. It took some trial and error to get what I wanted. (For one thing, if you reverse directions with this pattern, the result is dreidels spinning upside down.) Then I posterized the image and cropped it. So, for Chanukah, here are my spinning dreidels again. Happy Chanukah! This year I decided to draw a menorah on my iPad with the Brushes app. 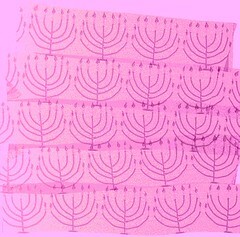 Brushes captures a stroke-by-stroke video as you draw, so I thought maybe I could make the menorah light up. I really had to concentrate on the order in which I drew things to get this to work. Even though I loved the animated effect, I wasn't completely happy with the little sketch, so I did some "post-production" work on it in Painter as well. Then I used iMovie to put the Brushes stroke-by-stroke video together with the revised sketch. Here it is, and I am sending this little menorah out to wish everyone happiness, light, and little miracles every day.